Lots of people know Ward’s Apparel and its founders Jack and Carolyn Ward, and people ask who is Joanie? Few people know that when Carolyn was growing up in Tennessee, she was known as Joanie to her family and friends. Her middle name is Joan. Carolyn (Joanie) and her husband Jack came to Mooresville in 1972 and started Ward’s Apparel in a small downtown location. Thanks to a lot of hard work and a loyal customer base Ward’s Apparel has grown into what it is today. Carolyn continues to work hard in the business and serving the community. Jack and Carolyn were named The 2015 Mooresvillians of The Year, honoring their years of community involvement. 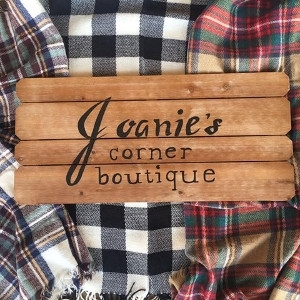 Now you can shop the new Joanie’s Corner Boutique when you visit Ward’s Apparel. Carolyn would like to thank all the employees and customers for their hard work, dedication, and loyalty throughout the years!